Severe traumatic injuries isolated to the midfoot region involving combined fracture and dislocation of the Chopart and Lisfranc joints are unique and uncommon. In the incidence of crush injuries and comminution with subsequent medial column shortening, maintaining anatomic reduction with rigid stabilization may pose a challenge to the surgeon. Bridge plating is generally used to maintain length, alignment and stabilize comminuted fractures by spanning across unaffected bones or joints, leaving the fracture area undisturbed. This technique reduces devitalization of fragments and promotes a healing environment. Temporary bridge plating over violated joints serves to maintain reduction and relative congruence. A case is presented of a 25-year-old male with a dislocated and comminuted navicular and Lisfranc fracture following a motorcyle accident. Crush injuries to the midfoot are uncommon accounting for 6% of traumatic midfoot injuries, with midtarsal joint (Chopart) fracture-dislocations being the most severe [1-4]. In a review of 155 patients, 72% of midfoot injuries were caused by traffic accidents with 52% and 17% caused by car and motorcycle accidents, respectively . Simultaneous fractures occur in approximately 75-90% of Chopart fractures, with only 10-25% percent of injuries being purely ligamentous [4, 5]. These injuries generally occur with high-energy trauma and are at an increased risk for soft tissue compromise and compartment syndrome. This may lead to long-term morbidity and functional impairment if misdiagnosed and not properly treated. Midfoot injuries typically result in multiple intra-articular tarsal fractures with the failure of key supporting structures, such as bony articulations and ligamentous attachments. When structures in the joint complex begin to fail, increased stress is transferred to the surrounding joints leading to subsequent loss of joint function. Failure of the talonavicular joint (TNJ) leads to flattening of the longitudinal arch, abduction of the forefoot, and a gradual valgus deformity of the subtalar joint resulting in a painful flatfoot . Pinney and Sangeorzan classified fractures of the navicular body into three types. In type I, the fracture line is transverse in the coronal plane with a dorsal fragment. In type II, the fracture line passes from dorsolateral to plantarmedial with the large fragment being dorsomedial. In type III, navicular fractures are comminuted and often result in medial disruption at the naviculocuneiform joint (NCJ) with lateral displacement of the foot and subluxation of the lateral column . Comminuted fracture dislocations of the navicular and cuboid, in particular, can result in medial and lateral column shortening presenting a challenge for the surgeon to restore the length and congruity of the joint. Typically, the treatment of choice for comminuted fractures involves stabilizing techniques such as bridge plating and external fixation. 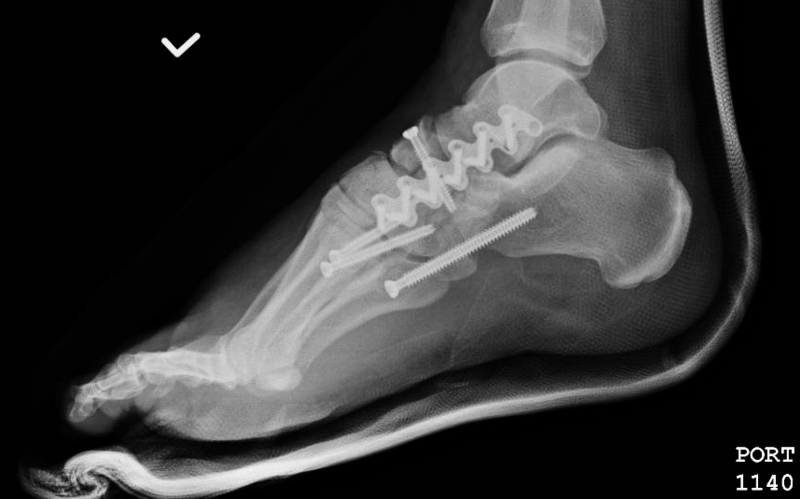 However, comminuted fractures specific to the midfoot have also been addressed through a variety of methods including closed reduction with crossing Kirschner-wire (k-wire) fixation, open reduction with k-wire or screw fixation, primary arthrodesis, external fixation and temporary bridge plating. Of these fixation types, bridge plates are advantageous because they allow the surgeon to maintain the length of the bones while also stabilizing the bony fragments too small for individual fixation. Bridge plating functions as an internal splint by providing fixation to both the proximal and distal intact bone creating a “bridge” over the site of comminution. The use of temporary bridge plating has been discussed in the literature as an alternative to external fixation to span comminuted fractures without extensive periosteal stripping or vascular compromise [8,9]. After healing is complete, the bridge plate is removed to restore joint motion. A 25-year-old male presented to the emergency department after crashing his motorcycle while intoxicated into a cement barrier traveling at a speed of 40-50mph. On physical examination, neurovascular status was intact and there were no open wounds or signs of compartment syndrome. Initial radiographs revealed a comminuted and dorsally dislocated navicular fracture along with significant disruption of the Lisfranc and midtarsal joint (Figure 1). Further detail was visualized in the computerized tomography scan (CT) revealing multiple fractures, which included a Type III intra-articular, comminuted, navicular fracture with a Chopart dislocation, a comminuted cuboid fracture, a Lisfranc dislocation, cuneiform fractures, and fractures of metatarsal bases two, three and four (Figure 2). Additionally, medial and lateral column shortening was evident with subsequent disruption of the talonavicular, calcaneocuboid (CCJ), and Lisfranc joints. Closed reduction was attempted in the Emergency room but was unsuccessful. He also sustained a nasal and left femur fracture. 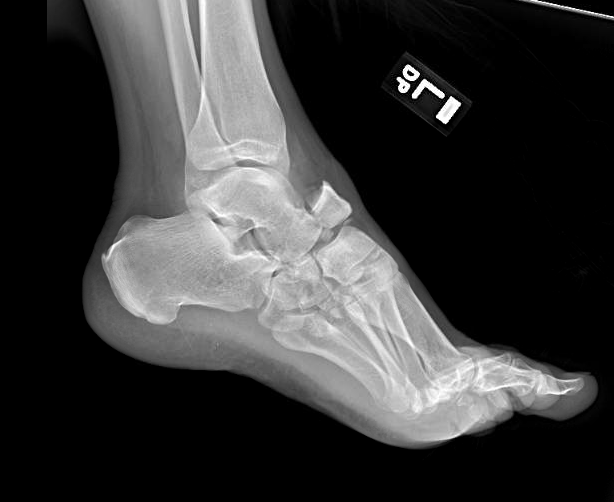 Figure 1A Lateral view reveals dorsally dislocated and comminuted navicular fracture. 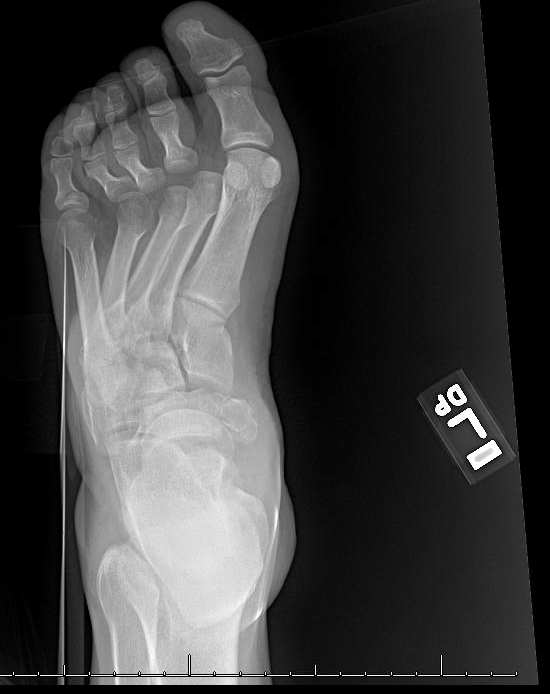 Figure 1B Anterior-Posterior [AP] view reveals comminution of the navicular, cuboid, Lisfranc fracture dislocation, and shortening of the medial column. Figure 2A CT sagittal view of the comminuted and displaced cuboid fracture. The patient initially underwent open reduction and internal fixation of his femur by an orthopedic surgeon. One week later he was taken back to the operating room with the primary goal of reducing the navicular bone, restoring the length of the medial and lateral column, as well as reducing and fixating the Lisfranc dislocation of metatarsals 2, 3, and 4. The patient was placed on the operating table in the supine position and a pneumatic ankle tourniquet was inflated to 225 mmHg for hemostasis. Prior to the incision, the area overlying the dislocated navicular was marked with a metallic marker under fluoroscopy. The dorsally displaced navicular fragment was then successfully reduced in a closed fashion with distraction of the foot in a dorsiflexed-inverted position. In order to appropriately restore the length of the medial column, it was deemed necessary to perform open reduction with internal fixation. A linear longitudinal incision was made dorsomedial to the TNJ and was carried distally past the first metatarsal cuneiform joint. Dissection revealed a large hematoma and rupture of the joint capsule above the TNJ and NCJ. The navicular was severely comminuted and the fracture fragments were rotated such that the articular surface was pointing away from the joint surfaces of the talus and cuneiforms. The large fracture fragments were then reduced into correct anatomic orientation, but the degree of comminution still yielded an unstable medial column. To span the area of comminution and stabilize the medial column, the bridge plate technique was used. The fracture fragments were temporarily stabilized with 0.062 inch K-wires and a 4.5mm cortical lag screw was inserted from dorsal to plantar in the center of the navicular fragment to maintain reduction and prevent dorsal displacement of the main body. A 12-hole plate was then temporarily fixated with olive wires and applied to the medial column spanning the talus, navicular and medial cuneiform (Figure 3). A total of ten 3.5mm fully-threaded locking screws were placed into the plate. Figure 3A AP view after open reduction and internal fixation of the medial and lateral column utilizing a bridge plate, Lisfranc trans-articular screws, and a lateral column positional “bridge screw”. 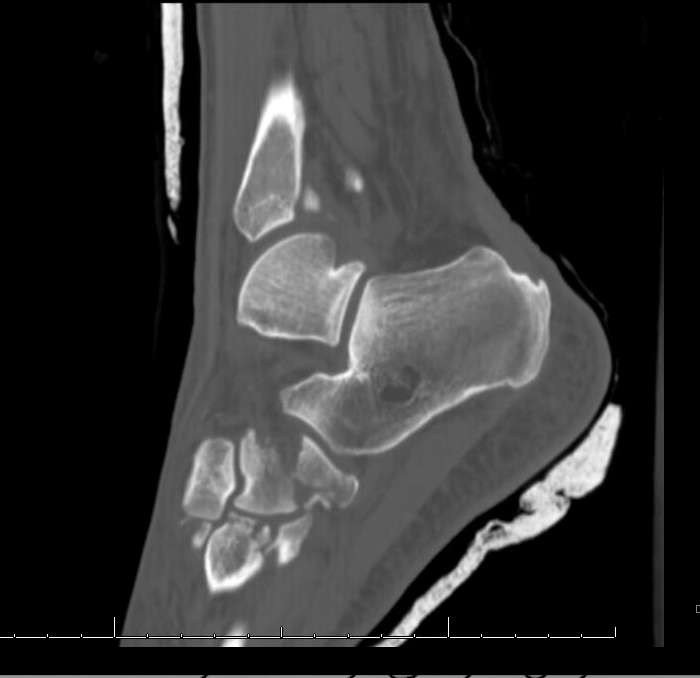 Figure 3B Lateral view reveals restoration of the longitudinal arch with reduction and stabilization of the previously dislocated navicular fracture. 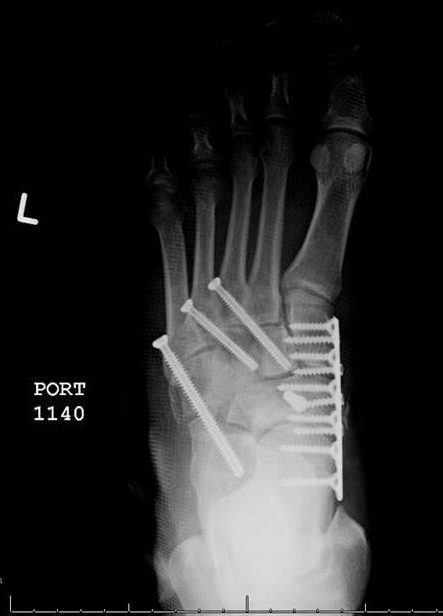 Closed reduction was performed with percutaneous fixation of the Lisfranc dislocation of metatarsals two, three and four using two 4.5 mm cannulated cortical screws. The first screw was oriented from the lateral aspect of the third metatarsal base into the second cuneiform, and a second screw was oriented from the lateral aspect of the fourth metatarsal base into the third cuneiform (Figure 3). To maintain reduction and prevent shortening of the lateral column, a 5.5 mm fully-threaded cannulated “bridge screw” was inserted percutaneously into the lateral aspect of the base of the fifth metatarsal, through the center of the cuboid to end in the anterior calcaneus (Figure 3). The purpose of this screw was not to provide compression but simply to maintain the position and length of the lateral column by bridging the comminuted cuboid. Post-operatively, the patient was placed into a well-padded posterior splint to accommodate for swelling that typically occurs after a traumatic injury such as this. The patient was instructed to be non-weight bearing on the affected extremity with the assistance of a walker. After two weeks the patient returned for his first follow-up visit. The patient rated his pain as 2/10 and well controlled with oral pain medication. At this time, the patient opted for a Controlled Ankle Movement (CAM) boot instead of a cast due to his uninsured status. The patient was instructed to remain non-weight bearing and to keep the CAM boot on at all times. At the six-week follow-up, the patient had disregarded our instructions and started weight bearing with the CAM boot. The patient presented to our clinic complaining of sharp heel pain both medially and laterally only while ambulating. The patient refused to have radiographs taken due to the cost. The patient was then lost to follow-up for some time. At the four-month follow-up, the patient returned to the clinic stating that he stopped wearing the CAM boot after the last visit and returned to full-weight bearing. Fifteen weeks postoperatively, he presented to the emergency department secondary to pain in his foot. Radiographs revealed osseous union of all fracture sites with no displacement. However, the positional screw in the lateral column, as well as two additional screws within the medial column bridge plate were noted to be broken. The patient underwent removal of hardware five months after the date of the original surgery. Intra-operatively, the navicular, and the medial and lateral columns were noted to be consolidated and in a rectus position with an intact medial longitudinal arch. Post-operatively, after the hardware removal, the patient was placed in a below-knee cast. After missing several appointments, the patient followed up one-month later stating that he removed his own cast with a hacksaw three days after surgery. The patient was placed into a CAM boot and instructed to decrease activity for two weeks before transitioning into regular shoe gear. Eight weeks after the hardware removal, the patient was back in regular shoe gear and denied any pain. One year from the original injury, the patient was satisfied with the outcome and was pain-free without any activity limitations. Midfoot injuries are uncommon because the corresponding joints contain strong ligamentous structures that are typically resistant to disruption. When these ligaments are disrupted or when fractures occur, dislocations may result to both the medial and lateral column, which may result in instability and shortening of the medial longitudinal arch or lateral column . Consequently, shortening of the medial column can result in pes cavus while shortening of the lateral column can result in pes planus . Main and Jowett determined that outcomes following midfoot injuries are dependent on the stability of the medial column . The outcome for crush injuries in their study was only fair in 75% of cases following open or closed reduction with plaster cast immobilization . Most of the crush injuries involving the navicular tend to be intra-articular at both the proximal and distal aspects because of the narrow anatomic shape of the bone . Despite anatomic reduction, a satisfactory outcome may be hindered by cartilage damage caused by the intra-articular fracture. Pinney and Sangeorzan recommend restoration of at least 60% of the articular surface of the TNJ to prevent subluxation following fracture healing . Temporary bridge plating allows for relative fracture-site stability despite severe comminution and thus has many advantages. It supports indirect healing and allows for adequate reduction without having to reduce and fixate each individual fragment. Bridge plates also restore length and alignment by spanning across unaffected bones, thus leaving the fracture area undisturbed. It also preserves the soft tissue attachments and blood supply by limiting extensive dissection needed for adequate exposure. In this case presentation, the plate was used to successfully bridge the medial column from the talar neck to the first metatarsal. The cuboid was also stabilized with a positional screw to restore the length of the lateral column. Schildhauer, et al., utilized a bridge plate in seven patients to span medial column injuries. All seven cases went on to heal and maintain proper length and alignment of the medial column . On the other hand, bridge plating across joints, especially in the midfoot, restricts motion significantly. Astion, et al., has shown that arthrodesis of the TNJ has shown to dramatically decrease joint motion at the subtalar and calcaneocuboid joints . Therefore, it is important to remove the plate and restore motion at the TNJ after the fracture is healed. Schildhauer, et al., recommend removal of the plate after 4-9 months to restore function to the TNJ and STJ . A possible complication with bridge plating as with any treatment of severe fractures is wound dehiscence. Open reduction and internal fixation should be delayed in the presence of extensive swelling or soft tissue compromise. Excessive soft tissue dissection and exposure of fracture fragments should be limited because the soft tissue structures are the vascular envelope responsible for nurturing and promoting the healing of the injury. In a recent study, van Koperen, et al., indicates that one of the drawbacks of bridge plating is extensive dissection during plate placement and removal, which can increase the risk of wound complications. However, in their study bridge plating did not lead to more wound complications when compared with trans-articular fixation . Atraumatic technique and understanding of surgical anatomy are important to prevent devascularization and limit post-surgical complications. Another complication with comminuted fractures is avascular necrosis. Sarrafian describes the blood supply to the navicular as being radial in its arrangement, with the central body being relatively avascular . 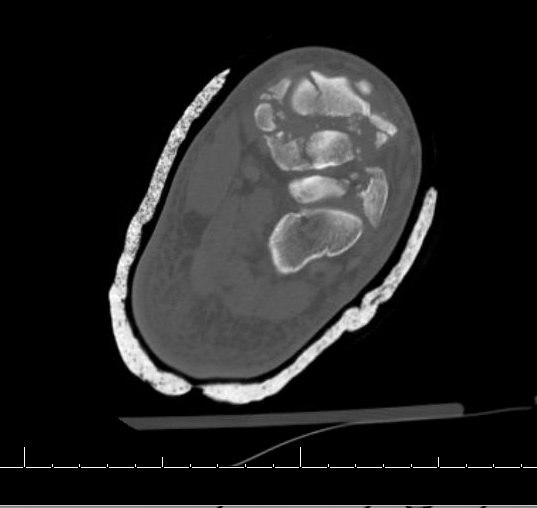 Sangeorzan, et al., found that after open reduction and internal fixation of displaced navicular body fractures, six out of twenty-one [29%] patients developed radiographic signs of avascular necrosis, however, only one lead to collapse . With appropriate fixation and understanding of the limitations of bridge plating, one can avoid complications such as non-union and avascular necrosis. Temporary bridge plating is a viable treatment option for comminuted midfoot fractures that span joints without extensive dissection or vascular compromise. It allows for relative fracture-site stability despite severe comminution and supports indirect healing without having to reduce and fixate each individual fragment. Bridge plates also restore length and alignment by spanning across unaffected bones, thus leaving the fracture area undisturbed. Overall, a good outcome was achieved using the bridge plate even with our patient bearing weight early, he was satisfied with the outcomes and returned to his previous activity level. Didomenico LA, Thomas ZM. Midfoot crush injuries. Clin Podiatr Med Surg. 2014;31(4):493-508. Richter M, Wippermann B, Krettek C, Schratt HE, Hufner T, Therman H. Fractures and fracture dislocations of the midfoot: occurrence, causes and long-term results. Foot Ankle Int. 2001;22(5):392-8. Makwana NK, van Liefland MR. Injuries of the midfoot. Current Orthopaedics 19:231-242, 2005. Main BJ, Jowett RL. Injuries of the midtarsal joint. J Bone Joint Surg Br 57:89-97, 1975. Richter M, Thermann H, Huefner T, Schmidt U, Goesling T, Krettek C. Chopart joint fracture-dislocation: initial open reduction provides better outcome than closed reduction. Foot Ankle Int. 2004;25(5):340-8. Sammarco, VJ. The talonavicular and calcaneocuboid joint: Anatomy, biomechanics, and clinical management of the transverse tarsal joint. Foot Ankle Clin. 9:127-45, 2004. Pinney SJ, Sangeorzan BJ. Fractures of the tarsal bones. Orthop Clin North Am. 2001;32(1):21-33. Schildhauer TA, Nork SE, Sangeorzan BJ. Temporary bridge plating of the medial column in severe midfoot injuries. J Orthop Trauma. 17:513-520, 2003. Cammack PM, Donahue MP, Manoli A. The bridge and barrel hoop plates as alternatives to external fixation techniques in the foot and ankle. Foot Ankle Clin. 2004;9(3):625-36, xi. Dhillon MS, Nagi ON. Total dislocations of the navicular: are they ever isolated injuries? J Bone Joint Surg Br. 81:881-885, 1999. Astion DJ, Deland JT, Otis JC, Kenneally S. Motion of the hindfoot after simulated arthrodesis. J Bone Joint Surg Am. 1997;79(2):241-6. Van koperen PJ, De jong VM, Luitse JS, Schepers T. Functional outcomes after temporary bridging with locking plates in Lisfranc injuries. J Foot Ankle Surg. 2016;55(5):922-6. Sarrafian SK. Anatomy of the Foot and Ankle, pp 340-342, JB Lippincott, Philadelphia, 1983. Sangeorzan BJ, Benirschke SK, Mosca V, Mayo KA, Hansen ST. Displaced intra-articular fractures of the tarsal navicular. J Bone Joint Surg Am. 1989;71(10):1504-10.